There's never been a better time to immerse yourself into the world of Valiant comics. With Faith, Ninjak, Bloodshot to name a few great comics, Valiant is on the precipice of entering the national consciousness as Sony prepares to bring its properties to the big screen. Harbinger: Renegade #1 is your gateway into the publisher's exciting world of psiots, super powered individuals, who populate this latest series. The debut issue is told in three parts with a great concise introduction of the history of the Harbinger mythos that dates back to 1992 when it first launched. Writer Rafer Roberts collaborates with different art teams to get everyone up to speed and explain the situation psiots face now and then. More importantly, when a team of renegade psiots exposes the Harbinger Foundation's experimental procedures to draw out the psiot gene from subjects, details go public on the internet creating a new dangerous organization. INTRODUCTION: In three pages, Roberts quickly and efficiently covers the history of psiots and the Harbinger Foundation including founder Toyo Hirada. Penciler Raul Allen and colorist Patricia Martin provide an eye-catching design with snippets of information spread throughout. A limited color scheme presents a bold opening that informs the reader and looks appealing. PROLOGUE: There's a time jump featuring Harada and his Foundation in the middle of covert mission on the other side of the world. It's a big cinematic action sequence with a clever and elusive target. Artist Juan Jose Ryp provides plenty of detail in an explosive sequence that Ryp lays out perfectly, keeping the tension with a few surprises. Colorist Frankie D’Armata uses some subdued colors with flashes of bold purple to accentuate the scenes keeping the focus on this smooth character. STORY: The story turns to the present day. With Harbinger Foundation's secrets out in the open, a novice underground group begins testing people promising them superpowers. However, their low-tech operation leads to disastrous results. It's a cause for concern with bodies piling up. The discovery of such deaths attracts Faith's attention and begins to investigate. She eventually seeks out help from her renegade friends who, with her, are responsible for what's happening now. This portion of the issue sets the stage for the series as the renegades have suffered a lot and gone their own way. Yet, they're responsible for what's taking place now and have to find a way their way to redemption. Roberts clearly develops the characters and their reluctance to reteam. The stakes may be high but the renegades' division seems irreparable. Faith, ever the optimist, is the soul of the group and just as likable as she is in her own series. Darick Robertson's pencils and Diego Rodriquez's colors frame the story with a mixture of close-ups and irreverent angles. The pacing is good with some shocking scenes. It reminded me of Sam Raimi's early work where it occasionally indulged in a campy sequence. Robertson does so in the more gory scenes for maximum effect. 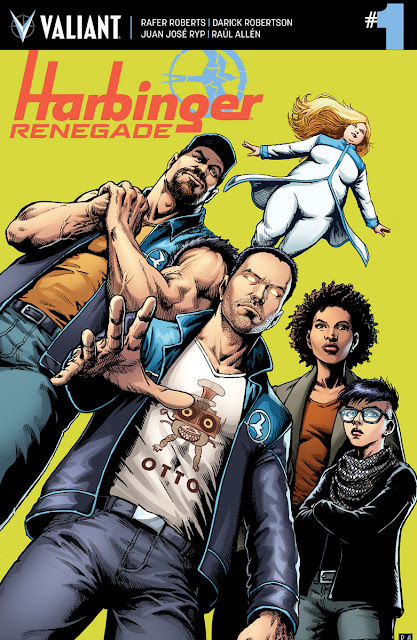 'Harbinger Renegade' #1 is the perfect entry point into the Valiant universe and this well-executed stunner of a story. New and old readers will love this new series that reads like an action-packed sci-fi/superhero movie. If you miss X-Men then this will satisfy your soul.